We've arrived! Last night we were treated to a fiery sunset to go along with our fresh Dorado and salad dinner. We were expecting the wind to die down somewhat as it often does at night, but the wind stayed at a pretty steady 12‑15 knots, giving us a delightful beam reach. 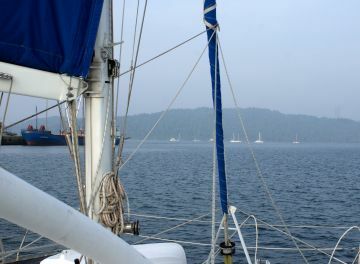 About 8pm we turned around the top of Invisible Bank and started heading directly for Port Blair. The moon lit our path for a few hours, and when it set the stars burst forth unimpeded - the North Star and Big Dipper to our right and the Southern Cross to our left. The seas were flat enough that we were both able to sleep when we were off watch. We picked up a lighthouse beacon at about midnight, and at first light we were just off the mouth of Port Blair bay. As we sailed gently into the bay we could hear the distinctly Indian music blaring from the shops on shore. Indians are the shop-keepers of the world (we've seen them in every country except Tonga) but they have this strange notion that their music, played very loudly, will attract customers. Since their music is somewhat discordant to our western ears, they're obviously not attracting us. Still, it's an interesting welcome to go with the earth-smells we always notice after an ocean passage. We are not alone. There are no fewer than 12 other cruising boats here in Port Blair, most waiting for the officialdom of port clearance to grind slowly through its inevitable course. For those using Google Earth, we're at 11°41'N 92°43'E. We'll probably be here a few days, waiting for officials and exploring the town. Then we'll be off to some of the outer islands, looking for clear water and new adventures.